The different seasons bring their own unique business security challenges as the year progresses, and at the height of summer the longer evenings and lighter nights – even in the small hours – give potential thieves a much longer window of opportunity. 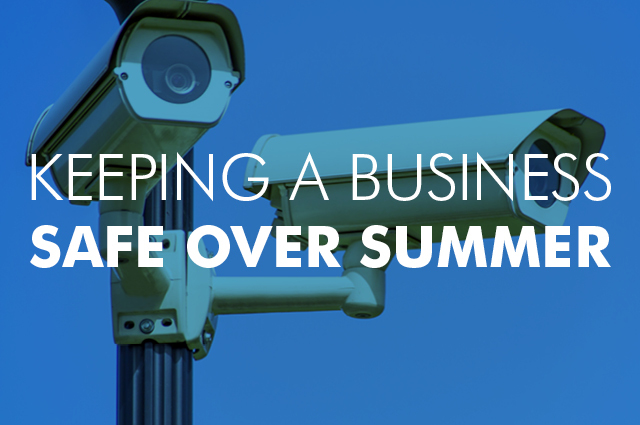 Keeping a business safe over summer doesn’t have to be a major headache, especially if you’re smart on security all year round, but there are a few things you can do to make sure your premises are protected. Whatever equipment you already have installed, the summertime is a good time to get it checked over – better weather conditions and longer hours of daylight mean it’s easier to carry out system maintenance, including on outdoor equipment like CCTV cameras and PIR sensors. By checking the condition of the security equipment you already have installed, both indoors and outside, you can identify any areas where you’re not well covered, or any new technologies you might want to consider installing. Make sure your intruder detectors are suitable for the way your workplace changes in the summer months – for instance, check that any PIR (passive infrared) motion detectors still work correctly when the ambient air temperature is much higher, and have them replaced with newer models if necessary. Indoors, make sure that intruder sensors on windows and doors are not triggered in the daytime if a member of staff just wants to let some fresh air into a hot room, but that they are all activated overnight, with all windows and doors properly closed and secured as a matter of routine. Access control systems allow you to give authorised individuals access to your premises at any time of day or night – ideal if anyone wants to take advantage of the longer days by arriving extra early or staying super late. Again, make sure that all entries are properly secured and alarmed at night, and consider installing CCTV and video intercom systems so that you can check on anyone who attempts to gain unauthorised access to your property. Motion activated floodlights are one of the best deterrents you can install, but if you leave your premises unattended in summer when it is still light, make sure you have a second deterrent fitted for when the lights make little difference to the ambient conditions. CCTV and audible alarms can help to hammer home the message that your premises are protected – and many intruders now realise that CCTV footage can be watched in real-time online, so that it is not just a case of reviewing camera recordings later. All of the above points have been mainly about protecting yourself against unauthorised intruders, but it’s also worth checking on your fire safety in the summertime, as everything from arson attacks to airborne candle lanterns can pose a threat. Just like your security systems, fire safety systems serve a hugely important purpose all year round, and emergency lighting will be even more crucial if an incident occurs on a dark winter afternoon, so get this done in the summer and you can relax for the rest of the year.